12 Mom Tips to Keep Your Kitchen Clean – Live. Simple. Good. My kids might be happy but I’m probably not. I don’t need perfection but when my home is a mess, I start to feel like a mess! 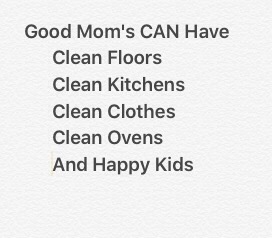 Good mom’s can also have clean floors, clean kitchens, clean laundry, clean ovens and happy kids. You can have a clean kitchen, clean oven and dirty laundry… Or any variety. It doesn’t all have to be clean but it doesn’t all have to be dirty either. It may not seem possible but it is. I have a 4 year old, 2 year old and 10 month old to prove it. Here are some cleaning hacks to get you started. 1) Start your morning by unloading the dishwasher. 2) Clean as you cook or prepare meals and snacks. 3) Wash pans right away. 4) Keep cupboards and drawers closed. 5) Keep the dishwasher loaded and then unloaded. If it’s full then stack dishes next to the sink until they can be loaded. 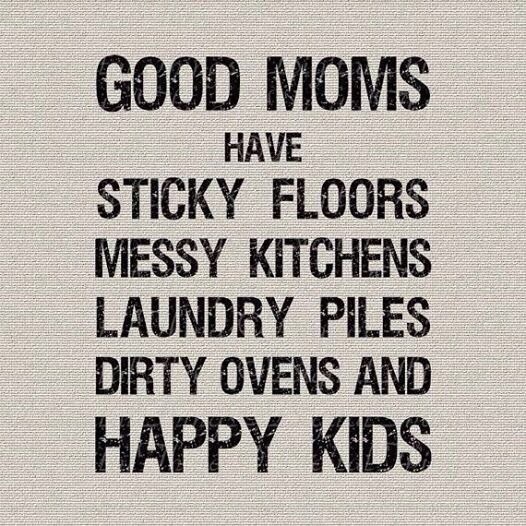 Or keep them stacked until you can handwash them. 6) Try decreasing the amount of dishes you have to one plate and one bowl per person. This limits the amount of dishes piling up. 7) Keep Clorox wipes on hand. If a spill is made toss one on the floor and scrub with your foot… To avoid sticky floors. Or use them for a quick counter wipe down. 8)To limit messes throughout other areas of the house, make your kids eat at the table. Baby Bjorn bibs are my favorite for keeping my boys clean and crumb free. 9)Have your kids bring their dishes to the sink and wipe down the table when they are done (even my two year does this). 10) Keep chairs pushed in at the table. 11) If crumbs are made, do a quick sweep under the table. Whether you like to cook or not, the kitchen and dining area is the center of the home, because everyone eats (especially our messy kiddos). Keep up on the kitchen and it’s the start of avoiding sticky floors and messy kitchens. It’s very important to teach our kids at a young age to clean. Let me know how it goes and stay tuned for some more cleaning hacks. Another mom, just trying to keep things neat. I’m trying to get better at this. And I do start with the kitchen. I clean the kitchen daily. Ie I don’t go to bed without wiping to counter sweeping, and putting stuff up. I may leave dishes in the sink. Everything else I leave until the weekend if I can’t handle it. It definitely takes practice as you adjust to kids! Great job getting everything wiped down before bed. I feel like the kitchen determines my productivity level when I wake up in the morning. So if it’s clean I clean and if it’s messy I’m already discouraged. Haha! I’ve nominated you for the Versatile Blogger Award. http://healthynappynerdymommy.com/2017/02/11/the-versatile-blogger-award Thank you for all your encouragement and inspiration.